The Nigeria Customs Service has confiscated 64 vehicles valued at over N1.3 billion during a raid at Omole Estate and Lekki Phase 1 in Lagos. 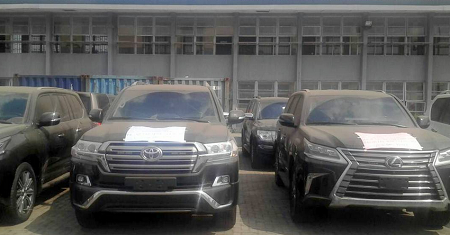 Three bulletproof sport utility vehicles were among the vehicles seized based on lack of End Users Certificate (EUC), the Customs said. The Federal Operations Unit, Zone A, Lagos, led by Mohammed Uba, on Wednesday said nobody had come to claim ownership of the vehicles two weeks after the seizure. “On assumption of office, I promised that on a monthly basis, I will bring to your notice of our activities,” Mr. Uba said. This seizure is coming barely a month after the agency, acting on intelligence reports, intercepted 59 bulletproof vehicles hidden in a house in Ikoyi, Lagos. The Customs comptroller said the new seizures were made through another intelligence report. Whistle blowers.